The Scarlet Macaw (Ara macao) is a species in danger of extinction. In Costa Rica, there are only two healthy populations of scarlet macaws, the largest of which is located on the Osa Peninsula. This population is estimated to be between 800 and 1200 individuals (Dear et al 2010). This population was almost completely eliminated due to the illegal removal of trees for timber and agriculture, hunting for food, and illegal trade of Macaws as pets. During the last two decades, commercial logging and hunting of birds has decreased significantly, and the population of Macaws of the Osa Peninsula has increased rapidly. However, the loss of natural cavities in the trees used as nests for these animals has greatly limited the recovery of their populations. A study in recent years recommended long-term conservation that combines environmental education in local schools, community involvement, and stricter penalties for hunters and the Lapa Roja habitat destroyers (Guittar et al 2008). 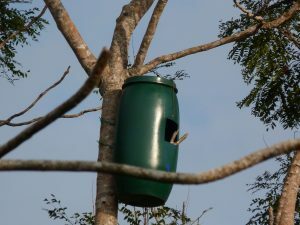 Elsewhere, the use of artificial nests as a means to increase reproductive success within a population has been highly successful (Nycander et al 1995, Vaughan et al 2005). To better understand the impact of the lack of natural nesting sites and to increase the reproductive success of the Macaws, Osa Conservation, in conjunction with Sea World Busch Gardens Conservation Fund, established a program in 2012 to monitor nests of scarlet macaws. This program consists of 18 artificial nests located at strategic points around the Osa Peninsula, which include local schools, hotels and some private properties within communities. The nests were put in place earlier this year, and we will continue to monitor their activity in our ongoing efforts to protect the Macaws’ habitat. This project involves children, teachers, tour guides, community members and conservation authorities in the region to monitor the activity around nests. Besides this, we have carried out educational activities and contests in local schools in order to increase awareness of our children in the conservation of the iconic species in the Osa Peninsula, which is in serious danger worldwide. To learn about the participation of schools in these citizen science efforts, check out this previous blog post by our Environmental Education and Community Outreach program manager Pilar Bernal. This entry was posted in Birds, Land Conservation and Forest Restoration and tagged artificial, avian, Birds, community, Conservation, Hansel, Herrera, iconic, involvement, Macaw, nests, protecting, Scarlet, species. Bookmark the permalink.